Last year, I had written a blog on Melaka Sentral Bus Terminal ( right click the sentence and open the link ) if you want to read it. For this blog, I would briefly write about the latest bus trip that I took from Singapore to Melaka. I bought the coach ticket at Golden Mile Complex at Beach Road and there are many bus operators there – pick that time schedule that is suitable. 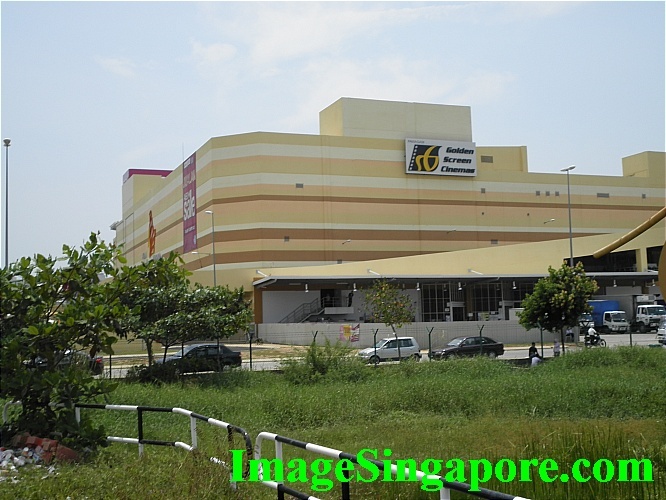 The AEON shopping mall is quite close to the Melaka Bus terminal. A good shopping mall to visit. On this trip, I decided to try Five Stars Tours and paid S$22 for a one way trip from Singapore to Melaka Sentral Bus Terminal. I was a slightly annoyed that the bus did not stop inside the bus terminal proper, but alighted us at a bus stop outside the Melaka bus terminal. As I know my way around, I simply cross the road and walked to the bus terminal. But I noticed that there were a few passengers who looked dazed as to where they were and asked the bus driver for direction. All this could be avoided if the bus could alight the passengers inside the bus terminal. 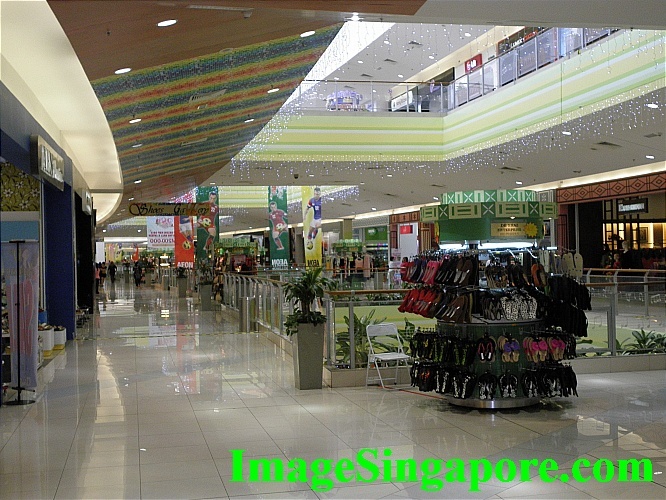 This is the interior of AEON shopping mall. From Melaka bus terminal, cross the overhead bridge, you can see TESCO, walk further and you can see AEON shopping mall. The Five Stars’ coach was a single deck bus with two rows of seats on the right and one row of seat on the left (27 seaters) and the seat was very spacious. Overall the bus was clean and comfortable. However, the driver was less helpful as compared to other bus operators. When arriving at customs checkpoint, the driver simply opened the door and expect passengers to know what to do. There were 2 ladies from China and 2 ladies from Europe who asked me whether they should bring down their luggage at Tuas Checkpoint. The driver of the coach should be made responsible for informing passengers what to do at the 2 checkpoints. Five Star Coach can also stop at Hatten Hotel in Melaka. The cost would be higher at S$30. 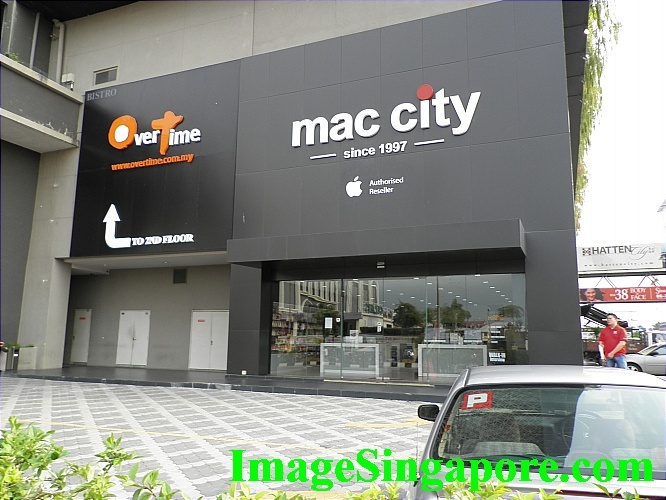 This is Hatten City Mall and the Hatten hotel is just next door. There was a stopover at Yong Peng bus terminal for passengers to have a meal, shopping for local products or go to the toilet. The time given was about half an hour. I noticed that Five Stars had a small kiosk at this place and some new passengers joined us from here. I think the stop at Yong Peng was good – as it gave me an opportunity to walk and stretch my legs. When the time was up to board the bus, I was walking outside towards the bus bay and the 2 European ladies came to me looking panic and told me they couldn’t locate our bus at the bus bay. I walked along the bus bay and it was not there. I told them that the bus must had gone to the petrol station. About 10 minutes later, the bus drove into the bus bay. This is the new Hatten Hotel which I had stayed while in Melaka. Read my blog if you are keen on this hotel review. If you drive to Melaka from Singapore, the duration should be about 3 hours. For this bus trip, it took nearly 4.5 hours to reach Melaka Bus terminal. This was because upon reaching Melaka, the bus had to pick up passengers at hotels in Melaka town; and thereafter proceed to the bus terminal. Previously when I took the coach operated by S & S International at Keypoint Building ( Beach Road) it was faster – there was no stopover at Yong Peng and the bus alighted at the bus terminal proper. I had also taken the coach from Sri Maju Group from Melaka to Singapore – the journey took 5 hours. I told my friend seated beside me that I could reached Kuala Lumpur within 5 hours from Singapore. Try Chicken Rice while in Melaka. 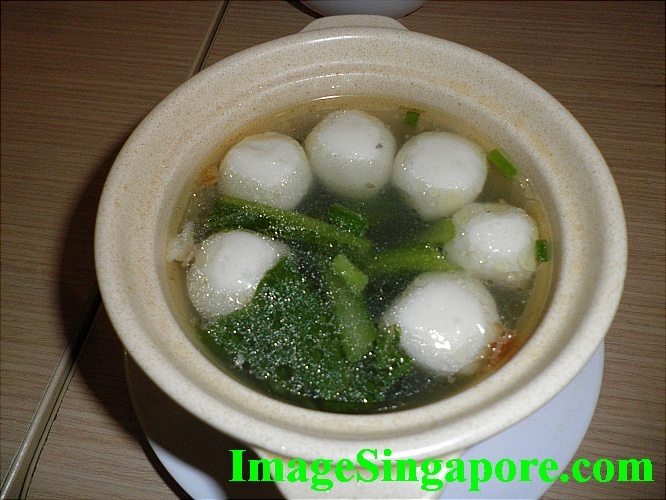 Those famous Chicken rice balls outlets are overrated, I don’t find it nice. 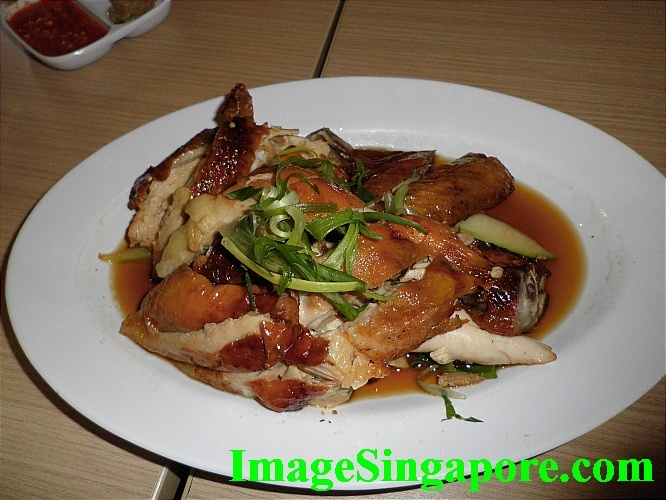 This chicken rice was from The Chicken Rice Shop franchise outlet in Melaka. Buy the set meal, it is cheap and good. The reason why I booked a one way ticket was because of cost. It is much cheaper to book a return ticket to Singapore from Melaka Bus Sentral. On the return trip back to Singapore, I booked 5 Stars coach again – the service is reasonably good if you don’t need any information or help from the driver; and you can tolerate a longer time to reach Singapore. The cost of the ticket was RM23 – that was only S$9.30 ( so much cheaper right). Anyway, even if you book from any bus operators, it would definitely be cheaper as the cost of the ticket is in Malaysian Ringgit. 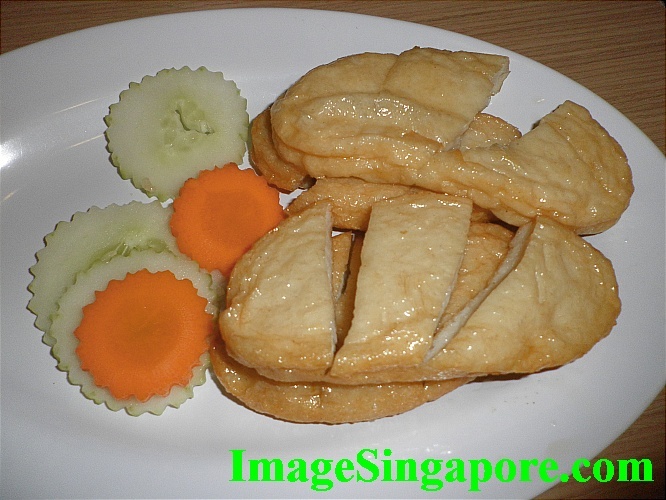 Very fresh and crunchy fish cake from The Chicken Rice shop. There were so much food with drinks for 2 persons and it cost only RM42. One of my favorite meal for dinner during a cold and raining night would be Mee Suah with herbs and Chinese Rice Wine. 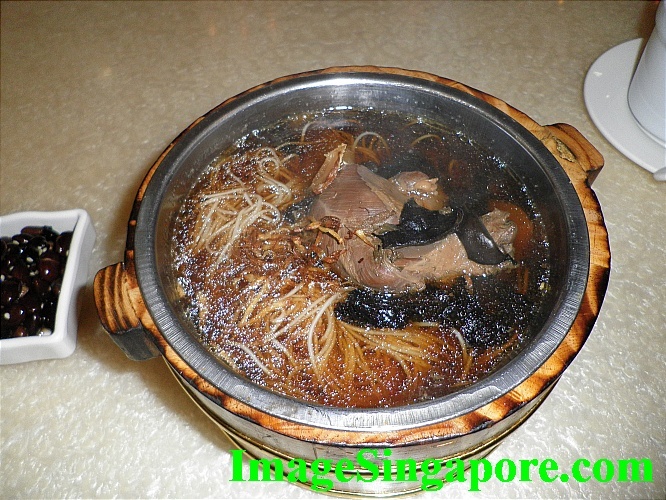 You can get this item from Tang Shi Fu restaurant in Malaysia. Tang Shi Fu has many restuarant outlets in Johor Bahru, Melaka and Kuala Lumpur; and it is relatively easy to find as most of their outlets are located in malls. 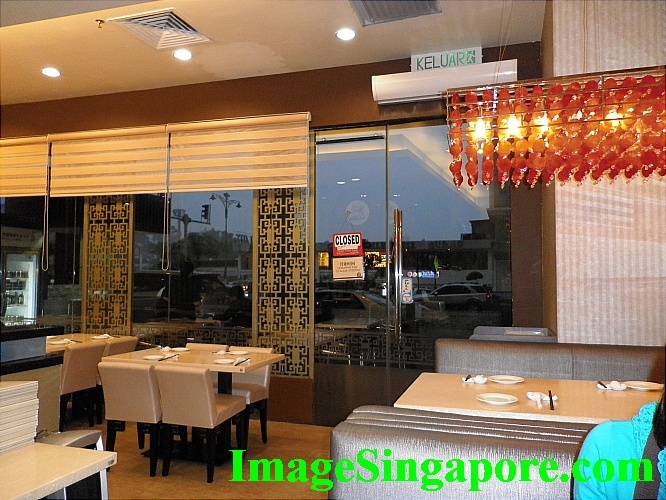 The restaurant that I went recently was located at Hatten Square in Melaka – just next to the main entrance of Hatten Hotel which I was staying. Mee Suah is simply Chinese wheat noodles which is very smooth in texture and is normally served with soup. This outlet is just next to Hatten Hotel Melaka. Incidentally it was raining very heavily that night, so I decided to walk out of the Hatten Hotel main lobby and the Tang Shi Fu restaurant was just next door – very convenient. I ordered the usual Mee Suah with herbs and Chinese rice wine and a Gingko with white fungus desert. For the desert you can either have it hot or cold – I ordered the hot version. 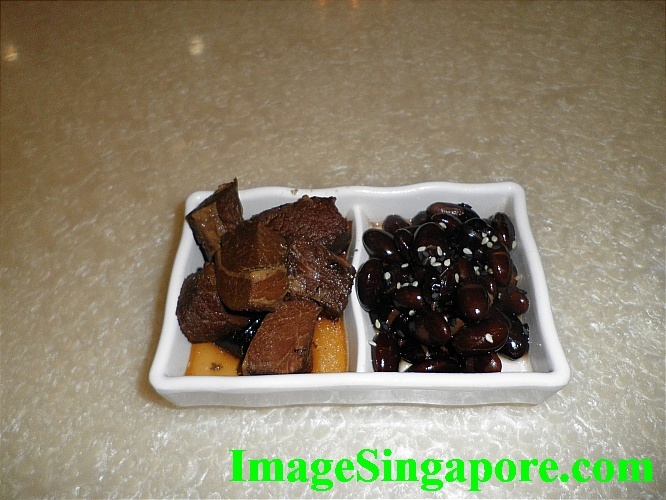 The Mee Suah set meal consists of a side dish of black beans and small portion of boiled pork meat. The cost of the Mee Suah set meal was RM13.90 and the desert cost RM5.90 excluding service charge and tax. Mee Suah with herbs and Chinese Rice Wine. The Mee Suah was very smooth and well cooked. I liked the soup because a generous amount of Chinese rice wine was added in it. I could actually smell and taste the overwhelming strong Chinese rice wine in the soup. So if you are not someone who loved the taste of Chinese rice wine, then this meal is not for you. 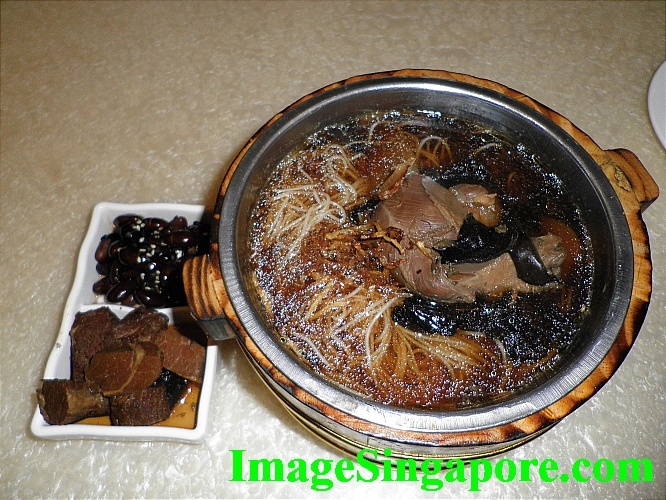 The portion of meat was sufficient and black fungus was also added in the soup. The only complaint was that the Mee Suah meal was served warm and not hot. My friend mentioned to me that my face was red after drinking the Chinese rice wine soup; and I felt very warm too. Gingko with white fungus desert. As for the Gingko with white fungus desert, it was served in a small white porcelain cup. I find that the portion given was small but it was delicious. 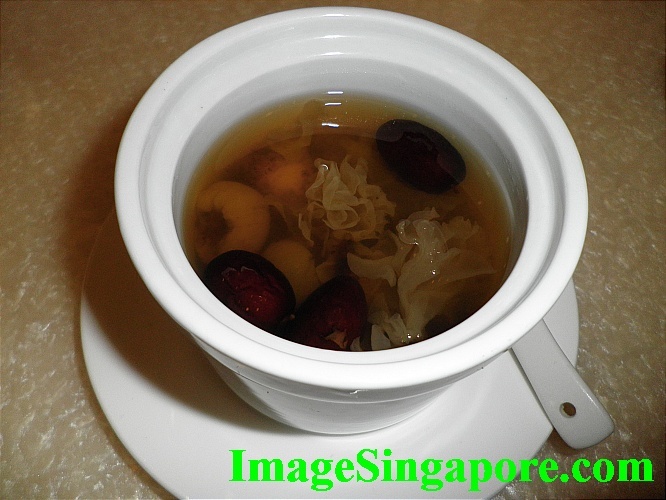 There were sufficient portion of Gingko nuts, white fungus and red dates in it. The desert was a little too sweet; but that is quite common in many of the Chinese deserts. Overall, I enjoyed my dinner at Tang Shi Fu. This is to place to go if you are looking for home cooked nutritious Chinese food and herbal soups. Side dish of black beans and meat.